4/15/2019 from 6 P.M. - 8 P.M.
Naomi Ruth Reneau, 88, of Celeste, was called Home to be with her Lord on Thursday, April 11, 2019 at her daughter’s home in Frisco. Funeral services will be 11 A.M., Tuesday, April 16, 2019 at Coker-Mathews Funeral Home Chapel with Rev. Larry Williams and Rev. Ron Hight officiating. Burial will be in McWright Cemetery. Visitation will be 6:00 P.M – 8 P.M., Monday, at the funeral home. Ruth was born April 12, 1931 in Celeste, Texas to Arland E. West and Ethel Gibson West. She married Clifford Lee Reneau on July 18, 1950 in Greenville (Peniel), Texas. 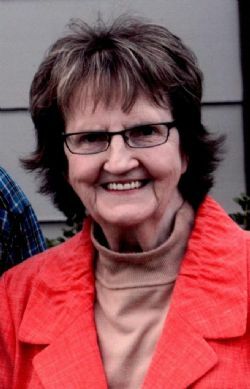 She was a dedicated and loving school teacher, a longtime active member of the Church of the Nazarene of Greenville, a prayer warrior and served on District Missionary Board for many years. She was honored with the Distinguished Service Award twice. She is survived by her husband, Clifford Lee Reneau of Celeste; daughter, Jan Ricks and husband, Mark of Frisco; son, Danny Reneau and wife, Janet of Silsbee, Texas; brother, Charles West and wife, Nancy of Greenville; three grandchildren; five great-grandchildren. She is preceded in death by her parents, three sisters and two brothers. Pallbearers will be Dr. Aaron Reneau, Matthew Reneau, Ray Robnett, Ray Pearson and Samuel Hight. Memorials may be made to Gideons International, P.O. Box 8976, Greenville, Texas 75404. The family is extremely grateful for her daughter, Jan and husband, Mark, caring for her mother for past seven years.